Supermyths are myths about myths that are created and compounded by experts, spread by pseudo-skeptics and destroyed by evidence. Braced myths are a sub-type of supermyth, created by orthodox expert authorities that are so powerful they are believed to be true by respected scholars who unwittingly promote them as examples of the need to be healthily sceptical of counterknowledge and then, with unintended irony, use them as argument winners to refute other fallacious knowledge. Letting scholars get away with publishing fallacies and myths signals to others the existence of topics where guardians of good scholarship might be less capable than elsewhere. Such dysology then serves as an allurement to poor scholars to disseminate existing myths and fallacies and to create and publish their own in these topic areas, which leads to a downward spiral of diminishing veracity on particular topics. Is the UK Home Office Zombie Cop Myth a deadly killer? On the Home Office Zombie Cop Supermyth: Should it apologise? Prof Mark Griffiths & I just had peer reviewed article published. This article describes the distinguishing characteristics of the supermyth and its even more influential sub-type: the braced myth. In addition, it provides links to the papers first written on the first three supermyths named: The Spinach Myth, The Zombie Cop Myth and The Crime Opportunity Myth. 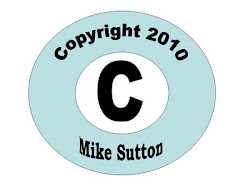 Mike Sutton is the author of Nullius in Verba - a book where every fact is independently verifiable and fully referenced. 1. That, contrary to prior knowledge-beliefs, Patrick Matthew's 1831 book - containing what Darwinists such as Richard Dawkins (in Bryson 2010 ) admit was the first and only pre-1858 complete hypothesis of natural selection - DID influence the pre-1859 published work of both Charles Darwin and Alfred Wallace on the topic of organic evolution and natural selection theory. 2. That Charles Darwin and Alfred Wallace each, independently, plagiarized the theory of natural selection from Patrick Matthew and then lied when each claimed no prior knowledge of it. What are supermyths and braced myths? Braced myths are supermyths that have been pointedly deployed by orthodox scholars in order to bust another specific myth or fallacy. The braced myth hypothesis is that using one myth as a specific mythbusting device in this way braces the supermyth to make it further entrenched and therefore more difficult to prevent it being credulously disseminated as veracious knowledge. What do we know about the impact of modern myths on society by way of their misinforming and therefore misdirecting central and local policy making, professional practice, teaching, learning and the media? The above question is of core importance in a topical area that is likely to grow in popularity, not least because international recognition of the importance of veracity in a wide variety of areas is reflected in a growth industry of recent publications that both inform and reflect the increasing number of experts and the international growth of interest groups promoting anti-quackery and skeptical inquiry in the natural and social sciences. I developed the concept of Supermyths from studying the literature on the importance of veracity in science. Essentially, supermyths are myths that are, with great unintended irony, credulously believed by scholars and used by them to argue for the need to be sceptical of widely accepted myths and fallacies. To date I have identified four supermyths - the Spinach Myth, the Zombie Cop Myth , Crime Opportunity Myth and the Semmelweis Myth. The modern myth is defined simply as a widely believed falsehood, which sets it apart from the older notion of myths as stories that are understood at some level to represent deep and enduring truths about social, spiritual or other psychological conditions of mankind. I hypothesize that the supermyth is a most powerfully influential sub-type of the modern notion of myth. 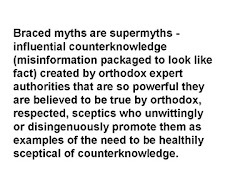 According to my thesis, what sets my idea of supermyths apart from other fallacies and myths serves as a unique and timely warning for those promoting the virtues of skeptical inquiry, because the great irony is that, unlike ordinary myths, supermyths are created by respected orthodox scholars and then credulously disseminated by other experts distinctively in the spirit of promoting skeptical enquiry. As if the existence of supermyths is not enough to be sceptically concerned about, I have refined the concept further by way of the identification of what I call braced myths. Braced myths are supermyths that have been reinforced by other scholars in that they have not just been disseminated by but also been utilised by credulous experts who have erroneously deployed them as ‘argument winners’ to bust other myths. By using a myth to bust a myth, I argue, these experts have braced the supermyth by dint of such powerful association with expert myth busting verity. Put simply, a braced myth is influential counterknowledge (misinformation packaged to look like fact) that is created by an expert authority and then believed by credulous yet highly influential skeptics who fail to adequately check its accuracy by way of primary data sources and/or fail also to question the rationality of its premises and also promote it as veracious ‘knowledge’. Finally, with unintended irony, they ignorantly deploy it as an intellectual myth busting weapon targeted at specific knowledge claims made by others. The Spinach Myth is the first supermyth discovered and also the first braced myth. This widely believed falsehood goes as follows: A published 19th century decimal point error in the iron levels of spinach led bio-chemists to reprint the error without checking the iron levels of spinach for themselves leading to generations of children being forced to eat unpalatable spinach, above other tastier leafy vegetables, for no good reason and this ten-fold error is the reason that Popeye ate spinach for strength. The Spinach Myth was finally busted after I was kindly assisted by clues provided by a friendly US skeptic who emailed me after reading my initial publication of a primary research paper that first bust the Popeye part of the myth. Further research led me to discover that it appears to have been first created by Professor Arnold Bender (an orthodox nutrition expert) at his inaugural lecture at Queen Elizabeth College, London in 1972 and then spread by many other respected academics, who, believing it to be true but not checking the facts, used it unwittingly in what ironically turns out to be a number of deeply embarrassing, hypocritical and self-defeating exhortations of the general need to be healthily skeptical by always checking the primary sources of claims made by others. The myth was then braced when a number of other credulous 'skeptics' portrayed it as an exemplar of veracious knowledge to criticize various specific research findings. I have written several articles on the Spinach Myth: the first one as a primary research paper on the importance of adequate citation and the second, which completely busted the myth here on Best Thinking. The second braced myth that I have discovered is the only other known example of the braced myth sub-type identified to date. I named it the Zombie Cop Myth, and this one is a widely believed myth about beat policing. .My jointly authored paper on this myth explains in detail its origin, where and how often it has been perpetuated, how it has been used, and most curiously how it has begun to mutate.You can read about it here on best thinking. Further details on (1) Darwin's Finches and (2) the Patrick Matthew supermyths can be found here. The third supermyth that I have identified is the myth that the widely accepted Routine Activities Theory and Situational Crime Prevention Theory notion of opportunity can be a cause of crime. Myth busting Crime Opportunity theory with logic reveals precisely how the widely accepted criminological notion of crime opportunity is based upon a simple error of reasoning. In a number of papers on the subject I have discussed the harmful implications for society of basing such theories upon irrational premises, or within irrational frameworks for theory building. I would recommend my paper Opportunity Does Not Make the Thief as a useful place to begin reading abut the Crime Opportunity Myth. Here on Best Thinking, I have revealed the existence of three influential examples of counterknowledge, which I have so far discovered, where highly respected experts - whose work is in turn supported by respected scholars in the same field - all failed to check the evidence and have been found to have accidentally created what appear to be influential supermyths. More research is required to seek likely causes and to understand the nature, known progress and impact of such myths. It is my hypothesis that supermyths are particularly deeply socially and academically embedded and harder therefore to limit than other modern myths. Furthermore, supermyths remind all who promote themselves as experts in their field to pay more attention to fact checking primary sources, providing adequate citation to statements of fact and to consider more thoroughly the premises upon which accepted theories and approaches are built. I began this brief article with a question and so it seems fitting to end it with another. The particularly telling question I would like to ask here is designed in part to serve as an embedded warning of the dangers of failing to check primary sources and of taking for granted the premises of theories. It is this: Might braced myths, such as the Spinach Myth and the Zombie Cop Myth, rank among the most exquisitely ironic discoveries of the unintended consequences of mankind’s purposive action? Everything on this blog reflects my own ideas and opinions and either does not or else may not reflect those of my employer or any other organisation. 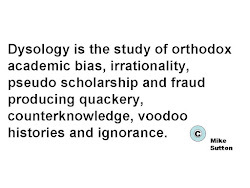 The supermyth and the braced myth subtype are ironic and unintended consequences of fallacy dissemination. The identification and description of unintended consequences from intentional behaviour has been a major component of sociology from its beginnings. Famous earlier examples of ironic unintended consequences have been discovered by social scientists and criminologists. These include Merton's Self- Fulfilling Prophecy, Wilkins’ Deviancy Amplification, Tannenbaum and Lemert's Labelling Theory, Young and Cohen's Moral Panics and Clark & Weisburd's Diffusion of Benefits Theory. The Vitamin C and Iron Myth: Death by Quackery? The Discovery of Braced Myths: The Most Disastrous Typo of all Time? Is the Home Office Facilitating a Myth about fear of Crime? What is a braced myth? Myth Busting: One possible unintended consequence. Will the growing myth-busting movement of healthy orthodox sceptics, publishing popular books to inform the public, lead to an ironic unintended consequence of braced myths increasing in number?